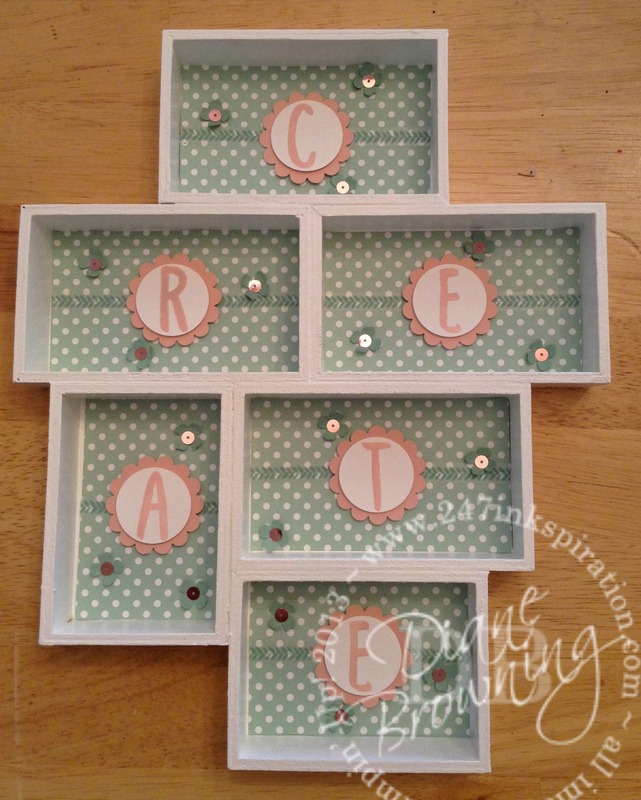 Today I’m sharing another group of projects that I made for OnStage this past April. You can see the Tip Top Taupe projects here and the Watermelon Wonder projects here. Out of the five 2015-17 In Colors, Mint Macaron is my favorite. Mint Macaron is a beautiful pastel green. It truly reminds me of the color of mint ice cream. Actually, mint in general is one of my absolute favorite colors. I even have a mint colored purse. First up is my 3D project. I found the wood case at a local craft store. I did have to paint it white. Who am I kidding? I talked my husband into painting it for me. After being married for almost 20 years I know exactly how to get things done around here. I’ll tell you at the end how you too can get those “honey-do” projects done. So this wood thing came assembled but in natural wood. We painted it white and I filled in the paper and embellishments. I love the daily reminder when I see this on the wall to “create”. Just like anything else, the more you practice, the better you get. Next up is my scrapbook page, which is actually a Project Life Pocket page. I used the full 6×8″ pocket page for this one. 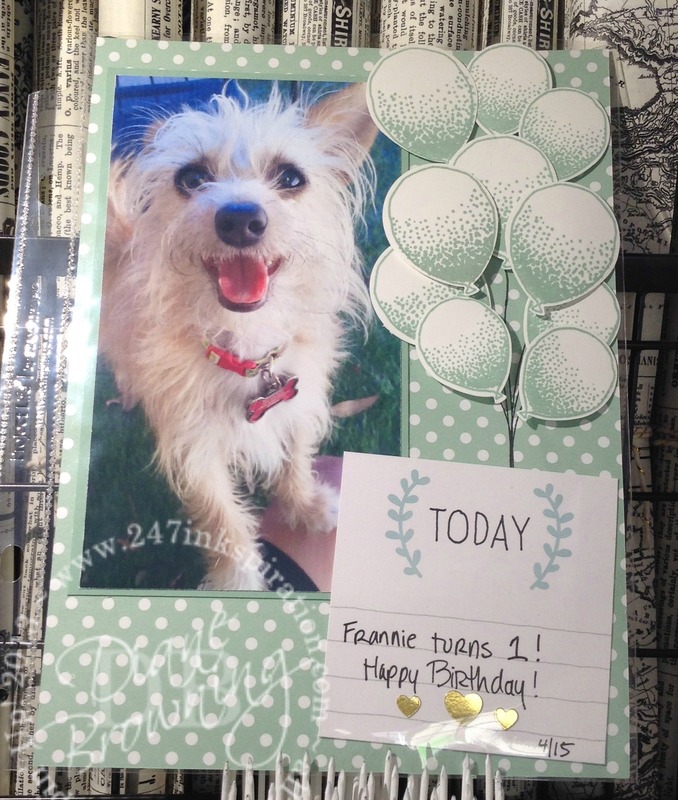 This picture is from my assistant Frannie’s birthday last year. We spoiled her with a trip to the pet store to pick out a new toy and buy a couple treats. I love how she is totally smiling in this picture. She is such a happy dog. We are so lucky to have her. She’s not so fond of balloons in real life, so I made a bunch of paper balloons for her instead. This stamp set, Love & Affection, is amazing. These flowers look really good in just about any color. I know you don’t see too many blue or green flowers in real life, but they look amazing here. Here’s a tip with this card, or any other card where you want to emboss the background sheet. Do your stamping first, then run it through your Big Shot. If you try to stamp after you’ve embossed it, you won’t get a nice clean image because of the raised edges. And that sentiment! I love it. It’s so simple, yet filled with meaning. The flowers were added with Dimensionals so some of the flowers are more raised than others. And my last Mint Macaron project uses the Fabulous Flora Host stamp set. I know, green flowers again. But that’s ok, the Mint Macaron is such a pretty color. 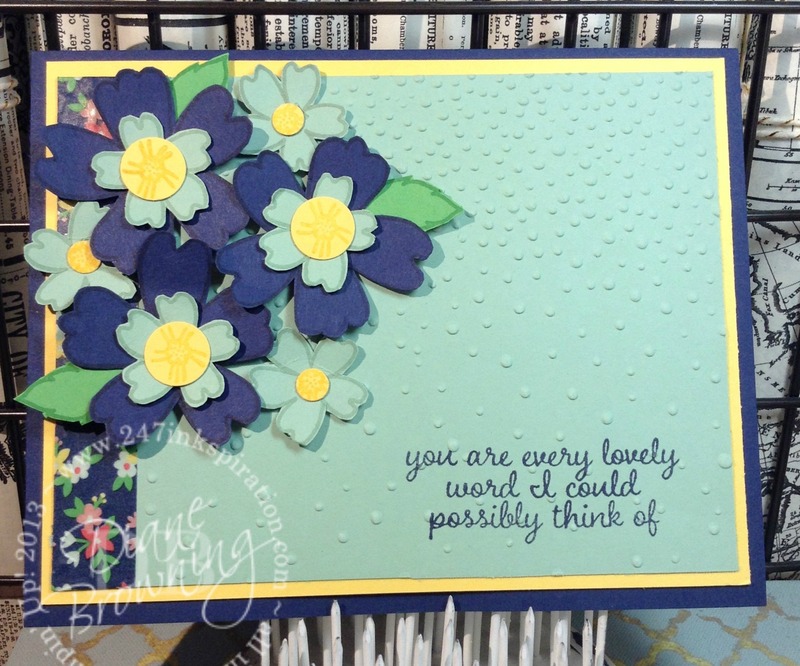 Using the Watercolor Wash background stamp, I stamped the background pattern paper to tone down all the white flowers. I like how it looks – you see the background sheet, but it’s the front panel that pops off the page. And that’s exactly what you want. And the ribbon! Oh my goodness! This new In Color ribbon is awesome. It knots beautifully! So here’s my trick on how to get that honey-do list done. Actually I have two tips. The first is plain old buttering up. Yep, when I ask my hubby for help because he does it soooo much better than I do, it almost always works. The second tip is to do it yourself. You’ve got to strategize with this one because you’ll want to make sure he sees that you’ve got something going on. I start with rummaging around in the garage “looking” for something. Then I make sure to walk through the room carrying a tool of some sort. Then I’ll disappear for about 5 minutes or so. Then I’ll go back out to the garage a second time looking for something else. And then walk back through the room with whatever it is. Then back out to the garage a third time looking for something else. I find that rummaging around in the nails and screws makes enough noise that he gets curious about what I’m doing. Usually, this is where he steps in and asks if I need help with something. Which I reply with “no, I got it” and walk by with the power drill and his box of drill bits. At this point, he really wants to know what I’m doing and follows me back to my project. He then sees all the pieces of whatever it is I’m building and promptly takes over “to make sure it’s done right”. Works every time. Tell us how you get your honey-do list done. Please share!